Good Morning! It's a another beautiful Colorado Morning. After the last few days of max coverage, today is relatively light for us. The Basics are busy as always cycling through the various activities and appointments necessary to get them ready to be in the Air Force. Most of us think of "In-Processing" as a one day event, but in reality it is a process that continues throughout BCT. In these first weeks, the military training happens almost in-between these appointments. As we get further along, the scales tip in favor of the training however and of course culminate out at Jack's Valley. On that note, one of the military training activities we will be covering next week will be flight drill. More about that in a future blog entry. Today, I want to talk about the PFT. 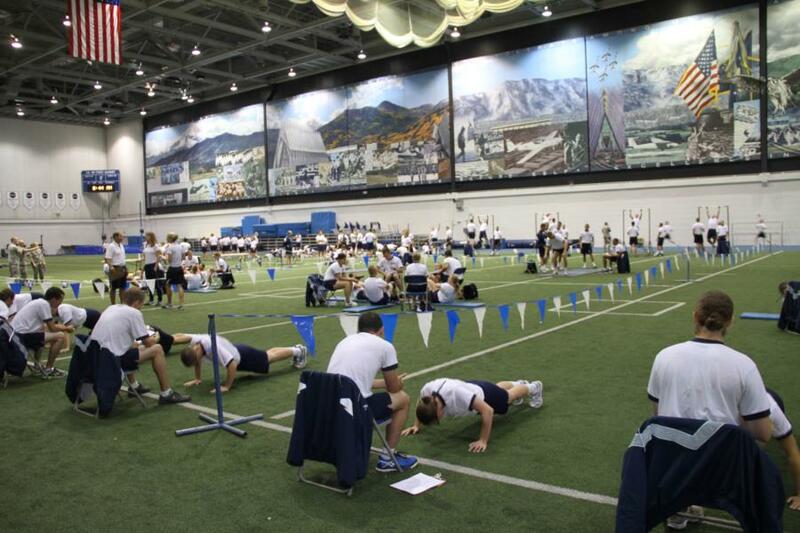 Cadets take physical fitness tests each semester to measure their overall strength and conditioning. Proficiency is required in both the Physical Fitness Test (PFT) and the Aerobic Fitness Test (AFT) in order to graduate. Tomorrow is the first for thie Class of 2020. It serves as a baseline. This test is different from the Candidate Fitness Assessment (CFA) that they took when applying to the Academy. Those members of the cadet wing who achieve the maximum point total on either the PFT or AFT belong to the prestigious 500 Club. Those few cadets who maximize their scores on both of these belong to the exclusive 1000 Club. Below is a table with the test elements along with the mean and maximum possible scores, courtesy of www.academyadmissions.com. We will be covering all the squadrons taking the test throughout the morning tomorrow. That doesn't mean we will get every basic, however. Some will elude us in the crowd and some will not take the test due to injury, illness, or other reasons and will make it up at a later time. On that note, we have received several emails asking about the blue belts. Basics wearing those are limited from some form of physical activity while they are wearing them. It alerts the Cadre. So there you go. Ok, that's it for now. More later.